Looking for climbing trousers? Check out our Buyers Guide! Straight to the top with climbing trousers! You can of course climb in just about any type of trousers, but climbing trousers have numerous benefits that you will not want to do without after a while. Climbing pants offer more range of motion, in contrast to normal pants. They are designed for climbing and especially bouldering trousers do not restrict complex movements. They are also very durable and robust, which is particularly important when climbing on rocks. And don't worry, you don't have to compromise on an attractive design. 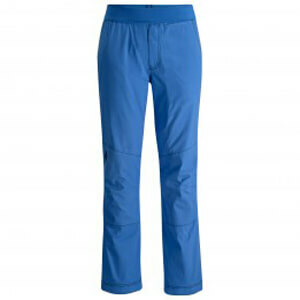 Climbing trousers are available from many manufacturers, in various styles and different colors. An important factor when choosing climbing trousers: the comfort and range of motion. Particularly high demands are placed on climbing trousers. You should be able to bring your knee to your chest and do both front and side splits without any restrictions. With that in mind, a wider fit is a good idea as are stretch panels or inserts made of elastic material in the places that are particularly susceptible when climbing, such as the knee. Most models also have articulated knees to allow maximum range of motion. Since climbing trousers are almost always worn with a harness, they shouldn't fold or crease where the harness rests. And the pockets should still be easily accessible when wearing a climbing harness. Climbing trousers come in different lengths. In the summer shorter pants can be more comfortable, but they should still cover the knee. This provides the knee with an additional layer of protection. And it is often worth wearing longer trousers for the approach, as you head through the undergrowth. What are rock climbing trousers made of? Climbing is a sport in which you can work up a sweat - especially in the sun. So a breathable material is desirable. Climbing pants haven't got it easy as far as other requirements are concerned. They should be abrasion-resistant and durable, but at the same time light, soft and flexible.